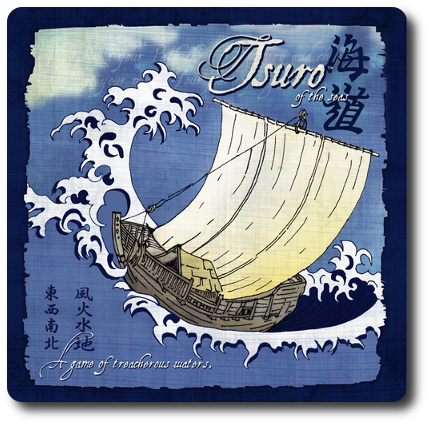 Tsuro of the Seas, designed by Tom McMurchie, Jordan Weisman, and published by Calliope Games, is comprised of 1 game board, 56 Wake tiles, 10 Daikaiju tiles, 8 Imperial Japanese Red Seal ships, and 2 standard six-sided dice (1 gold, 1 blue). 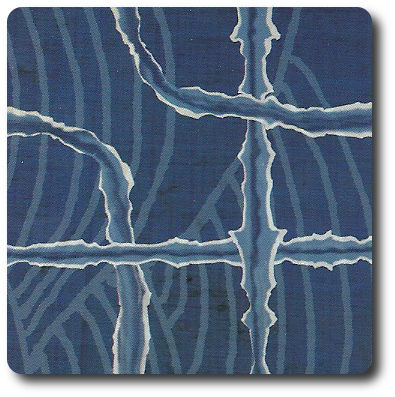 The game board and Wake tiles are thick and durable cardboard. The ships are small plastic miniatures. Excellent quality throughout. 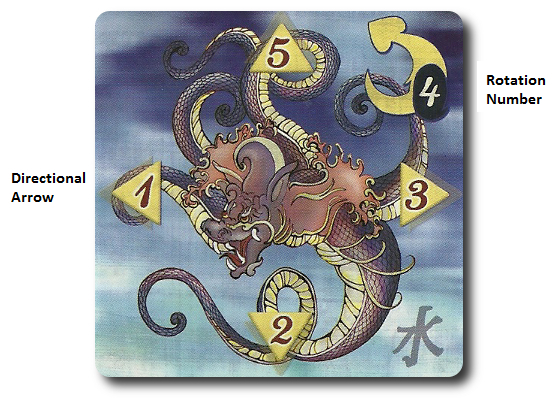 If you are familiar with Tsuro, Tsuro of the Seas is best thought of as the original game’s spiritual successor. To set up the game, first unfold and place the game board in the middle of the playing area. Have all the players sit around the game board. Second, shuffle the Wake tiles and deal out 3 to each player, face-down. These tiles represent the player’s starting hand. Players should keep their tiles hidden from their opponents until played. Place the remaining tiles, face-down, in a stack to one side of the game playing area. Third, shuffle the Daikaiju tiles and place them in a stack, face-down, to one side of the playing area. Fourth, have one player roll the 2 six-sided dice. The values rolled indicate the position of the first Daikaiju to be placed. Alongside the game board are numbers (1 through 6). Using the rolled dice values, the grid coordinate for the first Daikaiju is identified. Draw the top-most Daikaiju and place it on the game board, face-up. Repeat this until the specified number of Daikaiju are placed on the game board. The total number placed is determined by the number of players. Fifth, determine who will be the first player and then, in turn order sequence, each player places their ship on a white marker found on the edge of the game board. This represent the player’s starting point. This completes the game set up. Time to navigate the deadly ocean waters! Tsuro of the Seas is played in turns with no set number of turns in the game. On a player’s turn, they will complete the following steps in sequential order. The first action the player takes on their turn is determining if the Daikaiju move. The Daikaiju are huge dragons that look for hapless ships to swallow. The player rolls the 2 six-sided die. On a roll of 6, 7, or 8, the player must move the Daikaiju currently occupying the game board. Starting with the Daikaiju with the lowest rotation number, the player rolls 1 six-sided die. On a roll of 1-5, the Daikaiju moves in the direction the arrow is pointing or rotates one turn in the direction indicated by the rotation arrow. On a roll of 6, the Daikaiju does nothing. If the Daikaiju moves off the game board, they are placed at the bottom of the Daikaiju tile stack. If one Daikaiju moves into the position of a Wake tile, the Wake tile is removed and placed at the bottom of the Wake tile stack. If the Daikaiju moves into another Daikaiju, the Daikaiju not being moved is taken off the game board and placed at the bottom of the Daikaiju tile stack. If the Daikaiju moves onto a Wake tile occupied by a player’s ship, the player has lost the game and their ship is removed along with the Wake tile. If the Daikaiju moves to an adjacent Wake tile that contains a player’s ship and there is no way for the player’s ship to avoid the Daikaiju on their turn, their ship is removed and they have lost the game. Wait to remove the ship until step 2. If there are ever less than 3 Daikaiju on the game board, add new ones using the game set up rules BEFORE rolling for any Daikaiju. If new Daikaiju are introduced, the player can skip this step and does not roll for Daikaiju movement. Now the player selects 1 of the Wake tiles from their hand and places it down on any adjacent and empty board game square space next to the Wake tile their ship is occupying. The goal here is to move the ship on the game board for as long as possible, avoiding Daikaijus and sailing off the game board. A player’s ship ALWAYS moves along the path to the edge of their current Wake Tile. When placing a Wake tile, the paths (that look like a ship’s wake in the water) must not allow their ship to move off the game board (if at all possible), place the Wake tile so it puts the player’s ship in an endless loop, connect to a Daikaiju tile (again, if at all possible), or place the Wake tile so 2 or more ships travel the same path in the same direction. Wake tiles can be rotated in any way the player likes. The player now moves their ship, following the connecting wake paths, to the edge of their played Wake tile. If, that is, that have survived the Daikaiju attack. If the player has moved off the game board or into the hungry jaws of a Daikaiju, they are out of the game. Any other player’s ship that happens to be on a Wake tile that is connected to the newly placed Wake tile is also moved. This means a player could place a Wake tile that moves their opponent into dangerous (and sometimes fatal) waters! If the player does sink a few opponents, they can exchange any Wake tiles in their hand with an equal number of Wake tiles their opponents had. Finally, and only if the player’s ship is still afloat, they draw a new Wake tile to replenish their hand to a total of 3 Wake tiles. This completes the player’s turn. The next player in turn order sequence now goes starting with step 1 above. The game continues until only one player remains on the game board. If two or more player ships exit the game board as a result of a Wake tile, then these players win the game (essentially a tie). Tsuro of the Seas can be played using the Tsuro game rules. This is oftentimes the easiest way to teach the game to new players and removes randomness, as well as additional chaos. Simply exclude the Daikaijus from the game set up. To learn more about Tsuro of the Seas, visit the game’s web page. I rather enjoyed Tsuro and see no reason why other players (including myself) won’t enjoy Tsuro of the Seas. This version of the game allows for more players and introduced a nasty ship-eating random element that should be fun to play with and moan about. I predict the Child Geeks and the Parent Geeks will both approve the game with a smile and an occasional colorful word under their breath. The Gamer Geeks, in the past, have rejected Tsuro, but the original game has been played more often and the Gamer Geeks seem to be enjoying it. All I can predict is a mixed level of endorsement, as I know for certain that some Gamer Geeks enjoy Tsuro, while others simply tolerate it. Teaching the game is best done by example. I suggest you demonstrate how the Wake tiles are played and how ships are moved. I would also suggest that 1 player control the Daikaiju. This allows the game play to be a bit faster and allows you to get right into the game without teaching how the Daikaiju move. Note that this game can be played with Child Geeks pretty easily. If they can do mazes, draw, or even connect dots, they should be able to play Tsuro of the Seas. No reading is necessary. And so, after teaching the game to my two oldest Child Geeks (my 4-year-old didn’t have the patience to sit down and learn the game with his older brothers), I asked them their thoughts on Tsuro of the Seas so far. My little geek navigators are ready to jump behind the oars and navigate the dangerous seas. Let’s play the game and see if it’s a good time or we are left all wet. The Child Geeks had a great time with the game and were able to avoid the dragons, for the most part. The game is not that complicated to learn and has a comfortable difficulty curve as the game slowly ramps up. There are a lot of choices available to the player from the start, but as the game progresses, the number of possible paths becomes much more difficult. This was not lost on the Child Geeks and they did a great job of managing their hand of tiles and building paths that allowed for easy expansion. It’s the dragons that really caused them grief. A few of the Child Geeks learned the hard way that navigating close to a dragon was a very bad idea. Most of the Child Geeks steered clear, but you can’t dodge the dragons forever. 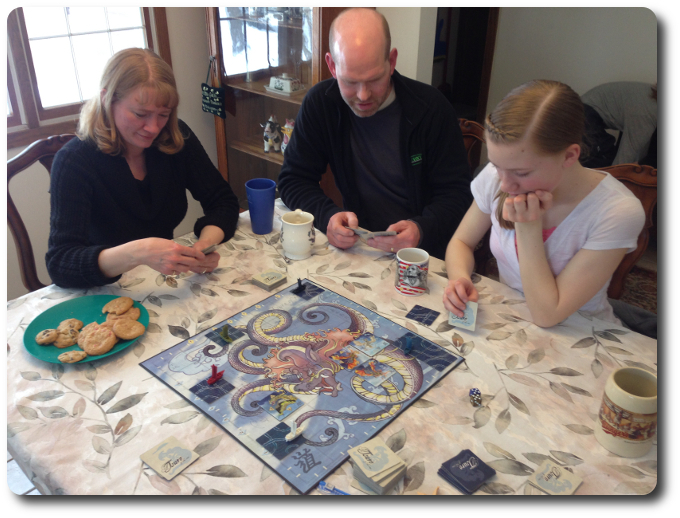 When all the ships were either sunk or eaten, the Child Geeks voted to approve the game. Their only negative comment was that it stunk to be taken out of the game early. The Parent Geeks also enjoyed the game, but found the new dragons to slow the game down a bit. They took my advice and just had 1 player control the Daikaijus after a single game turn with 6 players took over 8 minutes. As the game progresses and the players become more comfortable with the game, the game’s speed does pick up, as does the difficulty. It was a great deal of fun observing the Parent Geeks do their very best to duck and dodge each other and the dragons. According to one Parent Geek, “This game goes from easy to HOLY COW THIS IS HARD! I really like that.” Another Parent Geek said, “This is one of those games I would eagerly play with my family and friends on game nights or anytime.” When all the games were over, the Parent Geeks voted to approve Tsuro of the Seas. Both Child and Parent Geeks loved the game, and did all they could to sink each other! The Gamer Geeks enjoyed their time with the game. I wouldn’t go so far as to say they were overjoyed or excited by it, however. This is, after all, Tsuro with dragons. That’s a game they know pretty well and the game play introduced little that was new. What was new, the Daikaijus, were fun to play with and created some rememberable moments of swearing, laughter, and hollow threats of flipping the table. According to one Gamer Geek, “This is and continues to be a fun game. I think it’s perfect for lighter game nights or whenever you just want to play a game.” Another Gamer Geek said, “I think this is just like Tsuro, but with random ship eaters thrown in. That doesn’t strike me as new or inventive, but I really like how I can play using the new rules or the old rules depending on how I feel.” When all the games were over and the Gamer Geeks sat back to reflect on their game playing experience, they voted to approve it. Tsuro of the Seas is one of those games that I would bring to a dinner party where I didn’t know anyone. The game is very accessible, visually appealing, and easy to play. What I like best is that it’s never the same game twice and it can be devilishly hard to win. I have lost count how many times I was one of the last of 2 players only to be sucker punched by an opponent’s Wake tile placement or being eaten by a dragon. The game has real tension in it and there can be a lot of nail-biting moments. Especially when your ship is close to a Daikaiju. If you never believed that dice have an evil soul, you’ll change your mind after playing this game. It’s uncanny how some of those dragon “know” you ship is nearby. Do take a look at this game when you get a chance. If you already own Tsuro, you might want to consider upgrading your copy and donating your original. There really is no reason to own both. But if you had to own just one, Tsuro of the Seas is the one to get. Tagged Abstract Strategy Games, Child Geek Approved, Father Geek Approved, Gamer Geek Approved, Nautical Games, Parent Geek Approved. Bookmark the permalink.